Are you living the story that will keep your children and grandchildren on the edge of their seats? 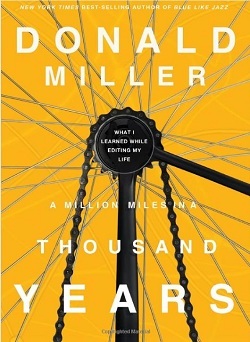 In 'A Million Miles in a Thousand Years" Miller asks himself this question. This was a life changing read for me. It was a simple, engaging and truly thought provoking read. Then again I say simple, and that is what I remember now looking back at the book, although some parts of the story was gripping and unpredictable. He starts the story where he found himself in life after he ‘made’ it. Having written a bestseller ‘Blue like Jazz’, financially better off and constantly at speaking engagements and other activities that would seem to be the ultimate place every writer would aspire to be. Miller however struggles to get out of bed in the morning. The twist in the story starts when Miller is approached by two guys who would like to turn his book into a movie. Through there interactions he realizes that would have to rewrite his New York best-selling book to turn it into a movie. He learns about the characters, plots and storylines that need to be in place to make a movie work. He learns that nobody want to watch a boring movie! But here is the amazing conclusion that he found himself at: If that applies to making a movie, then it also applies to real life. He starts turning his life around start doing things he has always wanted to and after a wild ride gets to meet his dad for the first time. It was a really a gripping read. As I mentioned it was really life changing to me. Are you living the story that will keep your children and grandchildren on the edge of their seats? What are the things you would need to change to make that possible? Those are the questions I asked myself after reading this book, and this was really the start to me making so drastic changes in my own life. If you ever wondered about these types of questions make sure to read “A Million Miles in a Thousand Years” as soon as possible. My big takeaway: Make sure your life is a story worth telling. This entry was posted in Book Reviews on 2012/11/06 by Justinus.